A new combined reception centre handling enquiries for two large departments of Tendring District Council (TDC) will open next week. 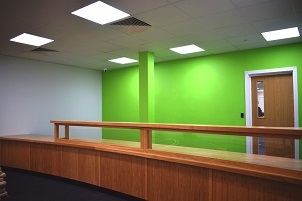 The council’s Pier Avenue office in Clacton, which was home to the benefits and revenues reception as well as other departments, has been closed to the public since June for a refurbishment as part of TDC’s Transformation Project. Now work on the ground and first floors are complete, the new-look reception area will open to the public on December 10. Joining the office will be the council’s housing reception, meaning the Pier Avenue building is the one-stop shop for people accessing housing or benefits services. Licensing will also return to the Pier Avenue office in the New Year, having moved temporarily to the Northbourne depot while work was carried out. The Tourist Information Centre will remain at Clacton Town Hall to deal with visitor enquiries and the Princes Theatre Box Office, and a self-service portal will also continue in the TIC to allow people to access a range of council services there. The Transformation Project aims to use more technological solutions to improve services and to be more efficient, and to improve offices and make them less costly to maintain. The programme will also see the redundant offices at Westleigh House in Carnarvon Road make way for more town centre parking early next year, and a move out of the Weeley site in late 2019. Work is ongoing on the top floor at the Pier Avenue office to refurbish it, as well as to create an internal link between the site and neighbouring Barnes House. Clacton Town Hall will be the next major refurbishment site under the Transformation Project, with work on the former housing reception and the surrounding wing of the building due to begin in early 2019. Carlo Guglielmi, TDC Cabinet Member for Finance and Corporate Resources, said the new-look reception area was a welcome improvement for both residents who use it and staff. “The new reception area at our Pier Avenue office in Clacton looks modern and fresh, and much more inviting for our residents and businesses who use it and the staff who work there,” Councillor Guglielmi said. “Refurbishment has also allowed us to fit new cables and building facilities which will be much more efficient to run, saving the council money in the future.